Guys, you've made great recommendations. Now I need more classics. Re: Guys, you've made great recommendations. Now I need more classics. Faust/CAN/NEU! are kind of the essential ones, in my opinion. Not sure I'd consider Tangerine Dream kraut rock, though others may disagree. And again: a lot of this stuff ties into music that Klaus Schulze (who I recommended on pg. 1) was making, and I like him as much or more than anybody listed above. I said he was working along similar lines as early Eno, and Eno did a couple discs with Cluster, so we're at full circle. Last edited by Nick Danger; 03-20-09 at 01:52 PM. I'll second/third the Talk Talk and Emmylou Harris nods. Buy all that you can get your hands on. 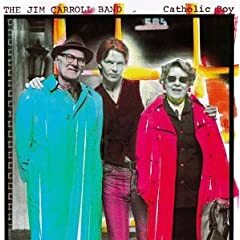 Jim Carroll Band, Catholic Boy -- I was a bit torn between this and I Write Your Name, but this is probably the better album and most people only know Carroll because of "People Who Died." If you're the hunting type, there are some unbelievably great live bootlegs of Carroll from the early ninties where you'll get the best of his work and the songs really come alive in these settings. I'm amazed that anyone remembers Jim Carroll. I still have my band tour T-shirt -- but I'm not as thin as I was in 1982, so it stays in a drawer. For Synth-pop, there's no better band, in my opinion, than Strange Advance. Made three masterly albums in the eighties (Worlds Away ('83), 2wo ('85), and The Distance Between ('88)), of which 2wo is only marginally less successful overall than the others. Unfortunately, their albums are scarce, but the anthology Over 60 Minutes with...Strange Advance covers most of their best songs. You can't go wrong with anything by Strange Advance. Also, check out The Dream Academy, especially their first (self-titled) and third (A Different Kind of Weather) albums. The second album, Remembrance Days, is markedly inferior. In a somewhat similar vein, I can heartily recommend Blue Nile's 1989 album Hats. Mood music at its best. For bouncy Brit-pop, it doesn't get much better than Wild Swans's Space Flower (love "I'm a Lighthouse" in particular). Also very good are Bringing Home the Ashes and Incandescent. Along the lines of Wild Swans, there are also the bands The Lilac Time and Care (Diamonds and Emeralds). I'm recommending all of the above based on your avowed fondness for O.M.D. For straight-ahead heartland rock, I think there's simply no better album than Tom Cochrane's Tom Cochrane and Red Rider. For punk, you might want to check out The Undertones. Last edited by Norm de Plume; 03-20-09 at 05:07 PM. I've got The Slider and enjoy it too. I guess I get more play out of Electric Warrior though. I got Aja through a recent AmazonMP3 deal. I had no clue where to go next with Steely Dan, but now I know. while I would have included 'Who's Afraid of' it's really 'Into Battle' that brought Art of Noise into fame, for the longest time, it was only available on vinyl and cassette, a CD release was a long time coming. I can listen to The Slider anywhere, anytime. Electric Warrior has some amazing songs ("Mambo Sun" is one of my favorite album openers), but it has some filler sprinkled throughout. The Slider has none, every song is great. As for Steely Dan, you really should get Countdown to Ecstacy, Pretzel Logic, Katy Lied, and The Royal Scam. Gaucho is good in its own way, but not up to the level of the others. Two Against Nature is worth it if you end up loving all the above. The Replacements: Let It Be and Tim -- Two separate albums, but these two represent the Replacements at the pinnacle of their talent. dBs: Stands for Decibels/Repercussion -- this is actually their first two albums, but they have been released together on CD. A great band that never caught on like they should have. Big Star: #1 Record/Radio City -- again, two albums on one CD. You cannot go wrong with Big Star. Sonic Youth: Daydream Nation -- I'm only going to name a single Sonic Youth album though you can't really go wrong with any of their stuff. But I could spend the rest of my life listening to nothing but "Teenage Riot" and I'd be OK with that. Pixies: Doolittle -- I'm sure it's not an original thought, but it occurred to me the other day that the White Stripes are nothing but a stripped down Pixies. I mean, can't you just hear the White Stripes doing Bone Machine or Debaser? If you like the White Stripes, check out the Pixies. If you don't like the White Stripes, check out the Pixies anyway because the Pixies did it better. Didn't realize no one had mentioned Daydream Nation. I saw Sonic Youth perform that album live in its entirety. Pretty fantastic.